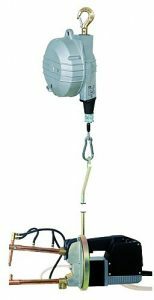 Tecna Portable Hand-Held Spot Welders - Spot Weld, Inc.
Spot Weld, Inc. is a distributor for an Italian brand of imported equipment that has a strong foothold in the US market. They are most often in stock and ready to ship. The Tecna line, imported from Italy, has beaten all the domestic competition with their economical, yet high quality line of welding equipment. The equipment is well supported and parts are readily available in North America and worldwide. Manually operated, no air or water lines to encumber movement. All transformers are coated with F class insulation material. Tests are made using 4000 volts. Max weld current approximately 6,000-Amps (with shortest arms, narrowest gap). 94mm (3.7″) gap between the arms. Supplied complete with 125 mm (4.9″) long arms. Max 380 spots per hour (6-7 spots per minute, roughly need to wait 10 seconds between welds to dissipate heat). Choice of additional arm configurations are available, see technical data for details. 12mm diameter rod for electrodes standard. 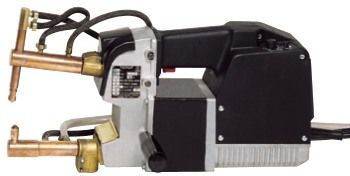 Fully water-cooled and pneumatic (“automatic”) portable spot gun. Similarly specified as the manual 7902 gun, but with considerably higher duty cycle and automatic clamping. (Welds the same, but will not overheat or overburden the operator). Uses standard RWMA electrodes, available throughout North America (The 7902 uses copper rod). Balanced construction for easy operation. Thread base for fixing on a bench. A built-in differential pressure switch operates the timer when the electrode force is correct. All transformers are coated with F class insulation material. Insulation test performed at 4000 V.
To be used with arms item 7512 – 7513 – 7514 – 7515, additional weld arms and spring balancer sold separately. Max 2000 spots per hour (33 spots per minute, roughly need to wait 2 seconds between welds to dissipate heat). Choice of arms and electrodes. 1MT/4RW tapered electrode holders. Larger sizes available as well. 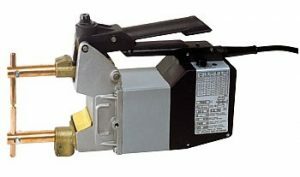 See our Manual Weld Gun page for more details.